Welcome to the studio of Fiddlehead Finery! Located in the quaint village of Norwood off the shores of Lake Michigan, this is where you’re most likely to find me. In the summer and spring, I leave the doors open to the colorful gardens and the variety of visiting birds. In the fall and winter, the large, torch-like maples are soon dusted with a layer of quiet snow. Inside the cozy studio, you’ll find me spending much of my time surrounded by warm antiques, stacks of dyed wool, patterns, and collections of work. Jars of antique buttons, spool cabinets that house a variety of colored threads, yarns, antique quilts, fabric, dyes, and patterns, are all neatly organized and ready for creating my recognizable folk art rugs with a contemporary flair. 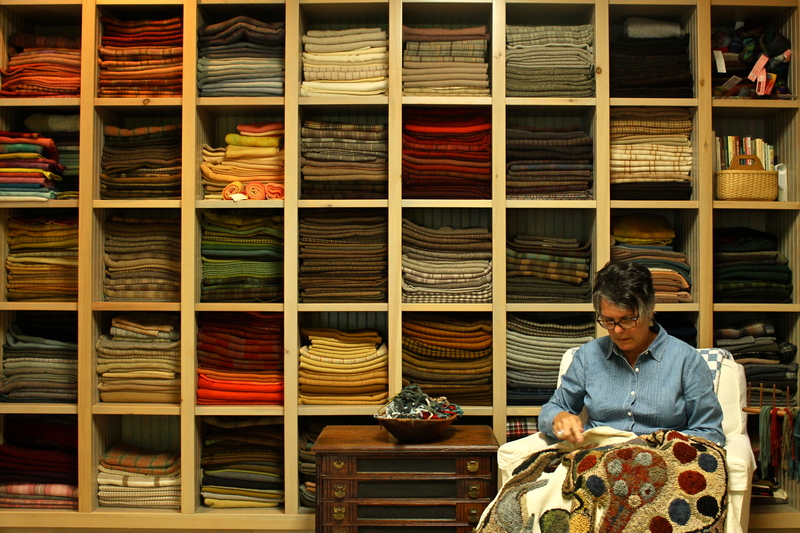 This is my creative home-away-from-home where ideas flow from paper to the dye pot to the final hooking of my rugs.